Scotland is a true walker's paradise, with everything from gentle lowlands and coastal paths to the more rugged mountains of the Highlands. Walking holidays in Scotland offer something for everyone. From the quiet countryside of the Scottish Borders to the dramatic scenery of the Highlands, our hiking tours include the best that Scotland has to offer. For those that like a challenge, tackle the classic West Highland Way joining the Scottish lowlands with the West Highlands, with its rugged landscape and magnificent mountain views. Or experience the gentler side of walking in Scotland on one of our easier walking holidays such as the Great Glen Way, ideal for those who want to see Scotland at its best, but with a little less effort.The route follows the classic Caledonian Canal and heads along the shores of the famous Loch Ness. For a longer walking holiday join these two stunning walks together for a true Scottish experience. The Rob Roy Way takes you on a journey through the Southern Highlands on a mixture of forest tracks, old railway lines and up into the hills. Along the way you will be rewarded with tumbling waterfalls, lochs and breathtaking mountain views. The Speyside Way heads inland from the stunning Moray coast, into the magical Spey Valley and through whisky country to finish in the foothills of the magnificent Cairngorm mountains. Enjoy a flavour of both Scotland and England on St Cuthberts Way as you meander through the Scottish borders, into Northumberland and across the causeway to the charming island of Lindisfarne. Along the way you can visit ancient abbeys, castles and a cave, all with historic tales to tell. The Arran Coastal Way takes you on an anti-clockwise journey around the coastline of Arran, one of the most beautiful Scottish Islands. Explore remote beaches as you make your way between the small coastal villages. With its diverse scenery Arran is known as "Scotland in miniature"
Whether you are looking for spectacular mountain landscapes, peaceful lochside views, a flavour of Scottish history, or a taste of salmon fishing and whisky distilleries, we can recommend a walking holiday in Scotland. A gentler introduction to the highlands, coast to coast from Fort William to Inverness and along the Caledonian Canal and the shores of Loch Ness. Through the Trossachs and the Southern Highlands on drovers tracks, paths, and quiet lanes. From the Moray coast walk through the heart of malt whisky country and into the foothills of the Cairngorms. The Speyside Way opened in 1981 and offers spectacular scenery in a region of Northeast Scotland famed for its Whisky Distilleries. It is a scenic walk along riverside tracks and through pinewoods, with plenty of opportunity to sample the local malt whiskies along the way. Starting in Buckie on the Moray coast you will walk through the heart of malt whisky country and towards the foothills of the Cairngorms. Generally the way is straightforward, along paths and disused railway lines, through farmland, across hills and through splendid scenery of mixed woods, beside the river Spey. A great riverside walk along one of Scotland longest rivers. Relaxed easy walking (for Scotland! ), and straightforward navigation. Enjoy the peace and tranquillity of one of Scotland's quieter corners. Pay a visit to one (or more) of the many distilleries in the malt whisky capital of the world. Finish in Aviemore, at the heart of the Cairngorms National Park. Through the quiet countryside of the Scottish Borders from Melrose to the Holy Island of Lindisfarne in England’s border county of Northumberland. St Cuthbert’s Way threads its way through the quiet countryside of the Scottish Borders and Northumberland, joining together places associated with the 7th Century Saint. It begins in the market town of Melrose in the Scottish Borders and finishes on the Holy Island of Lindisfarne on the edge of the North Sea. In-between it takes in some beautiful countryside, including the banks of the River Tweed and the foothills of the Cheviot Hills, and visits important historic sites such as Dryburgh Abbey and St Cuthbert’s Cave. Starting in Melrose you will head through the Eildon Hills with great views of the surrounding countryside, before following the banks of the famous River Tweed. After a quick detour to the ruins of Dryburgh Abbey, you follow the course of Dere Street, an ancient Roman Road, before heading cross country to Kirk Yetholm, the end point of the Pennine way. You will now head through the foothills of the remote and beautiful Cheviot Hills, and on to the sleepy market town of Wooler. As the coast draws near, you will visit St Cuthbert’s Cave before descending to the unique tidal causeway which leads to Holy Island with its spectacular priory and castle. A pleasant meander through the peaceful Scottish Border's countryside with lots of historical interest. Take it easy and enjoy the quiet paths on this generally well waymarked route. Crossing the tidal causeway to the Holy Island of Lindisfarne, with the dramatic setting of the castle and priory, makes a memorable end to the trip. The classic Scottish long distance route from the edge of Glasgow along the shores of Loch Lomond and into the heart of the West Highlands, finishing at the foot of Ben Nevis, Britain’s highest mountain, at Fort William. The West Highland Way was the first long distance footpath to be established in Scotland. The route begins in Milngavie near Glasgow and after 95 miles of outstanding scenery, finishes in Fort William, at the foot of Ben Nevis, Britain’s highest mountain. The West Highland Way connects with the Great Glen Way, which Mickledore also offers to walkers, who want to walk all the way from Milngavie to Inverness. The West Highland Way threads through Scotland’s history, following in the footsteps of drovers, pilgrims, soldiers, clansmen and cattle-rushers. Some of the walking is straightforward and some of it involves scrambling. It is important to note that some areas can be very exposed and must be taken seriously, as the weather in Scotland is very unpredictable. Click here to read about our colleague Tara’s walk on The West Highland Way. A tremendous route joining the Scottish lowlands with stunning Highland scenery. 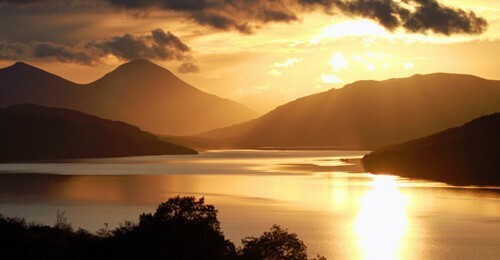 Walk along the “Bonnie Banks” of Loch Lomond with great views of the mountains. Cross the remote wilderness of Rannoch Moor, with its unique landscape. Savour the excitement & achievement as you near Fort William, with Ben Nevis towering above. This was my fifth walk with Mickledore, and I am impressed with the accommodations and the planning that your company put into each package.